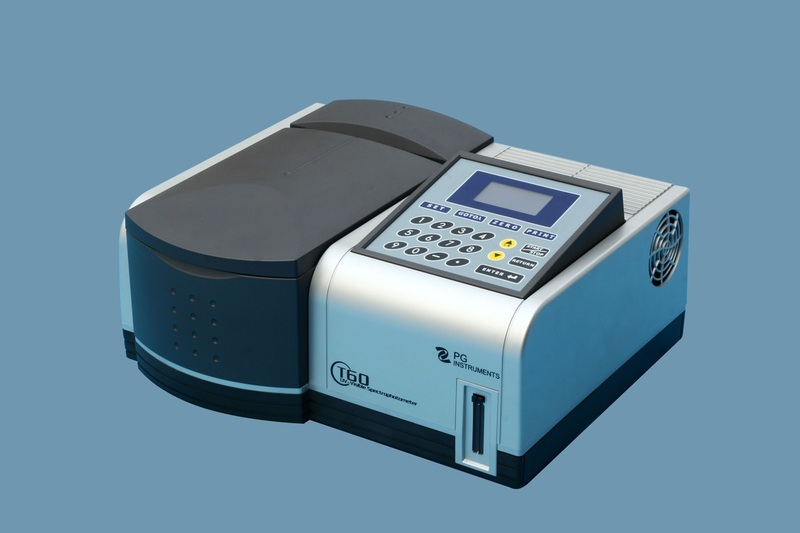 T60 UV/VIS Spectrophotometer - Oasis Scientific Inc. The T60 UV/VIS is a split beam UV Visible Spectrophotometer with a fixed slit of 2nm, providing the functionality of an advanced instrument at an affordable price. The instrument covers a wavelength range of 190-1100nm. The T60 UV/VIS has a small footprint and includes UVWin 5 software offering photometric measurement, kinetics measurement, quantitative measurement, spectrum scan, and DNA/Protein analysis. The user friendly control software also offers many other applications such as access to data base, three-dimensional spectral analysis, GLP laboratory protocol, fast analysis of pesticide residues, drug, food, etc., required for environmental analysis. The system is supplied with an eight-position motorized cell holder as standard. The T60 UV/VIS boasts a performance comparable to larger and more expensive machines. It is designed for a wide range of applications, industries, sample sizes, and types.